A concrete driveway, when poured correctly will provide years of service for average car traffic. In addition, your driveway may serve as a border to your property or a basketball court for your children. In order for a driveway to withstand the weight of vehicles and extreme temperature shifts, it must be sufficiently thick and reinforced with additional materials. In 1865, the use of Portland cement in concrete broadened its appeal in construction and other applications where a hard surface was desirable. Old driveways and walkways followed no standard rules but with the adaptation of uniform building and construction codes, most driveways poured today meet a minimum thickness of 4 inches, although drives used by large commercial trucks will be thicker. The process of pouring a driveway correctly ensures that it will retain its strength even under the weight of automobiles. This is accomplished by using at least 4 inches of concrete on a compacted sand base and reinforcing the wet concrete with steel mesh or rebar. In addition, after the concrete dries and cures, an experienced builder will cut the driveway with control joints that serve as the weakest point, allowing the concrete to crack along the control joints instead of across the uncut surface of the drive. Freezing temperatures play havoc with concrete driveways. As the temperature rises and drops, the concrete expands and contracts. Although control joints should handle any small cracks, water must not puddle on the drive or it will increase the risk of additional cracks. 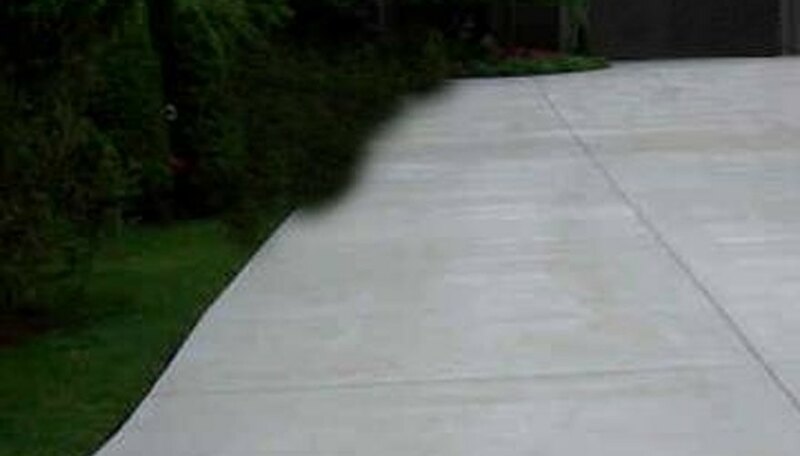 A concrete driveway must slope slightly in one direction to prevent pooling. The standard slope for a drive is 1/8-inch of drop for every one linear foot. A 12-foot wide driveway would be 1 1/2 inches lower on one side than it is on the other. The larger the driveway, the greater the need for reinforcement or additional concrete. Because the ground naturally shifts in some areas, even slight movement will crack a large area of solid concrete. The greater the surface area, the more resistance the concrete slab exerts and the more likely it is to crack. If you must pour a driveway wider than 20 feet, consider adding additional reinforcing mesh or another inch of concrete. Concrete needs time to cure. A new driveway may feel hard to the touch a few hours after the workers poured it, but it will take a few days to cure completely and form the needed strength to hold your vehicles. If you are not in a hurry, keep cars off your new drive for a couple of weeks and spray it down with a hose twice a day to lengthen the curing time. This allows the concrete to cure gradually to its strongest state.